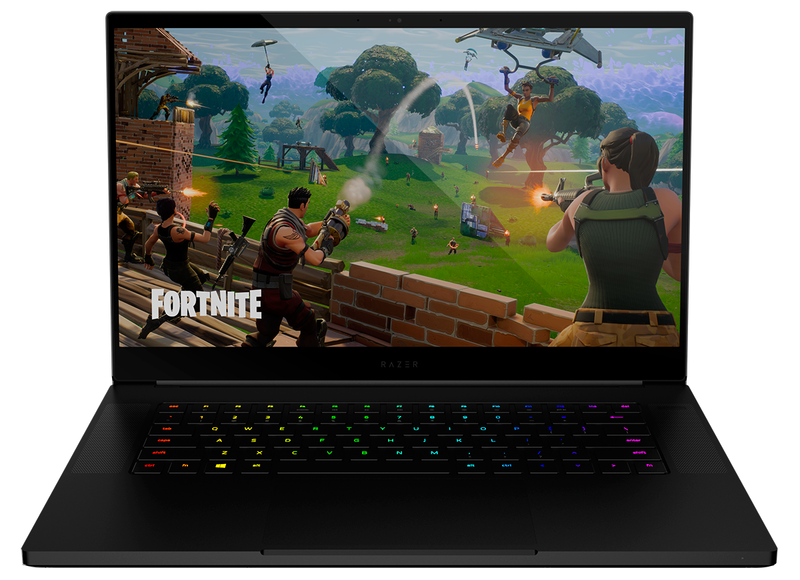 Every gaming laptop manufacturer is introducing refreshed models outfitted with a new-and-improved Intel Core i7-8750H processor, but Razer is hoping to go one better with a completely revamped Blade. Introduced as a successor to the popular 14in model, the new laptop touts a 15.6in display with hardly any detriment to overall size or weight, making it the smallest gaming laptop in its class. The chassis has also been updated with a more modern look, there's a GTX 1070 Max-Q GPU in the offing, and a 144Hz display promises to maximise gaming potential. 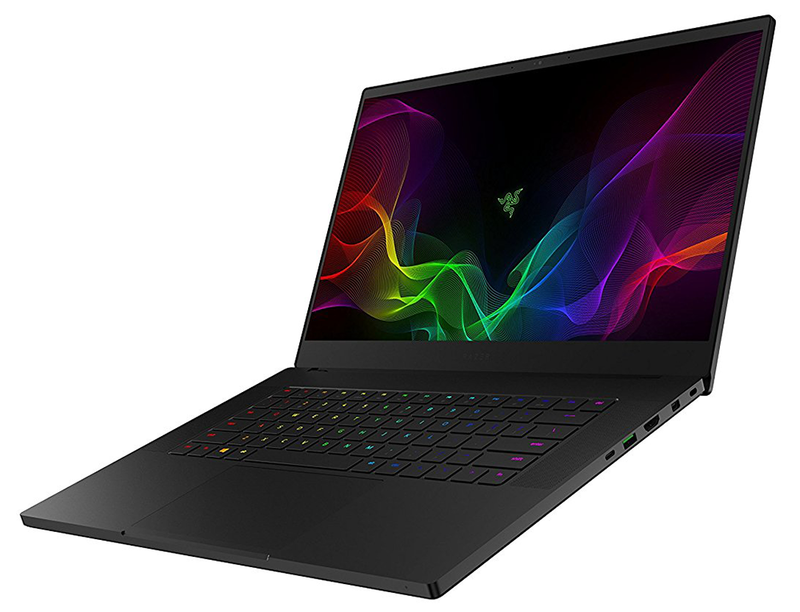 The specification sheet is an enthusiast's dream, so without further ado, let's take a closer look at the all-new Razer Blade 15. There are plenty of highlights to discuss, but our favourite is arguably the new chassis. Whereas the Blade 14 had a curvy, Macbook-like aesthetic, the Blade 15 is a sharper, more angular and grown-up proposition. The black anodized paintwork is sadly still a fingerprint magnet, yet if you keep it clean, this is without a doubt one of the most stylish 15.6in gaming laptops around, and despite the bright green Razer logo on the lid, you wouldn't be embarrassed to carry it into business meetings. Dimensions of 355mm x 235mm x 16.8mm are impressive - it's even smaller than Gigabyte's petite Aero 15X - and though the overall weight is just the wrong side of 2kg (2.1, to be exact), that's a small price to pay for the robust chassis. CNC milled from an aluminium block, the high-quality body is noticeably rigid and serves as a key differentiator alongside plasticky competitors. Remember the thick, dated display bezels on the Blade 14? They're now a distant memory. Blade 15 may be only 10mm wider in profile, yet it manages to squeeze-in a 15.6in panel with ultra-slim trimmings on the sides. It is an elegant finish, and we like the fact that Razer has kept the 720p webcam where it ought to be at the top of the display, though if you want to be critical, it's a shame the webcam hasn't been upgraded to an infrared model supporting Windows Hello. Still, as far as 15.6in gaming laptops go, we have a new frontrunner in terms of style, footprint and quality. High-quality construction doesn't come cheap. 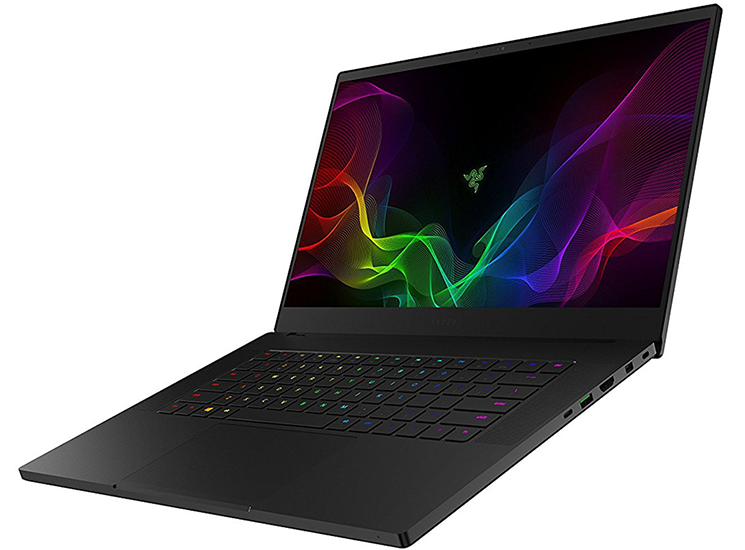 Blade 15 starts at £1,700, though for that amount of money you'll be limited to a 60Hz full-HD display, GTX 1060 Max-Q graphics and a 256GB SSD. Upgrading to the 144Hz panel sees the price tag jump to £1,980, and if you want to add GTX 1070 Max-Q graphics into the mix, you'll need to shell out £2,150. Our review sample also adds a 512GB SSD, raising the price another notch to £2,330, and if you favour productivity over gaming, there's an optional 4K touchscreen with 100 per cent AdobeRGB coverage, yours for a cool £2,550. Blade 15 doesn't come cheap, though that's hardly a surprise now, is it? The likes of the Asus ROG Zephyrus M and Gigabyte Aero 15X will offer more bang for your buck, but if you've got your heart set on a Blade, you shouldn't be left wanting in terms of performance. Each model comes equipped with a hexa-core Intel Core i7-8750H processor, 16GB of DDR4-2666 memory in a 2x8GB configuration, and M.2 SSD storage. We suspect the matte 144Hz IPS panel is going to prove most popular among Razer's target audience, and it's a fine display, offering good viewing angles, decent out-the-box colour accuracy and a refresh rate that's well suited to fluid gameplay. There's no support for G-Sync adaptive framerate smoothing, with Razer instead choosing to use power-saving Optimus technology to switch between onboard Intel UHD 620 graphics and the GeForce GPU as and when necessary. Wireless capabilities are up-to-date courtesy of an Intel Wireless-AC 9260 adapter, and the available ports cover most bases. The laptop's left side carries a proprietary connector for the external 230W power supply, a pair of USB 3.1 and a combination audio jack. Over on the right you'll find Thunderbolt 3 Type-C, a third USB 3.1, HDMI 2.0b, mini-DisplayPort 1.4 and a Kensington lock. A solid selection, though gamers may lament the lack of Ethernet, and we're surprised Razer doesn't include a USB-to-Ethernet adapter to appease the enthusiast gaming crowd. 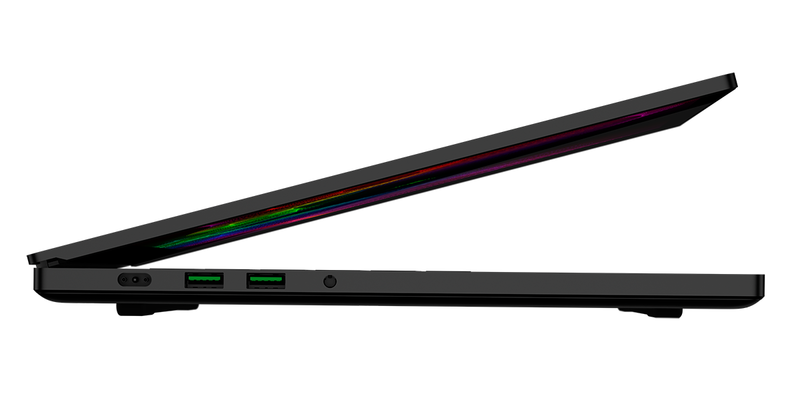 Creating such a sleek profile does inevitably result in some instances of the laptop favouring form over function. An Ethernet jack likely doesn't feature as its inclusion would spoil those otherwise seamless edges, and there are similar shortcomings to the keyboard. It might be the prettiest panel available on a gaming laptop, with Chroma illumination adding extra shine, however the short key travel isn't ideal when gaming, we aren't fond of the up arrow being to the left of the right shift key, and though the lighting effects are cool, we're disappointed to find that Razer still hasn't found a way to illuminate the media shortcuts. It's a nice enough keyboard, but it isn't a great one, which is a shame as the surrounding components are up there with the best. These include an extra-large Precision trackpad that is hard to fault (though some will no doubt be irked by the removal of physical buttons), and stereo speakers that flank the keyboard and provide more punch than their size suggests. 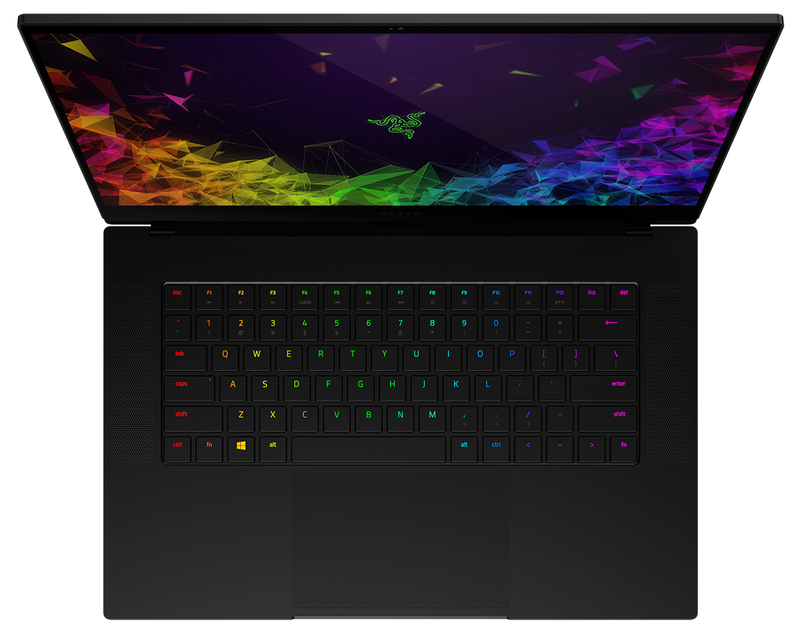 All things considered, this is the best-looking and most powerful Razer Blade to date, yet shoehorning a hexa-core CPU and GTX 1070 Max-Q graphics into such a svelte chassis is no small feat, and given that Blade 14 was known to be hot and noisy, Razer has adopted vapour chamber technology this time around. The new cooling configuration is aided by dual fans, yet while the Blade 15 keeps reasonably cool and quiet during everyday tasks, the same problems remain when the going gets tough. Just about every gaming laptop gets warm during gameplay, but our Blade 15 review sample became alarmingly hot. The area above the keyboard becomes almost uncomfortable to touch after 30 minutes of gaming, and we certainly wouldn't want the system on our laps. Does that suggest throttling will be prevalent? Let's run the benchmarks and see.